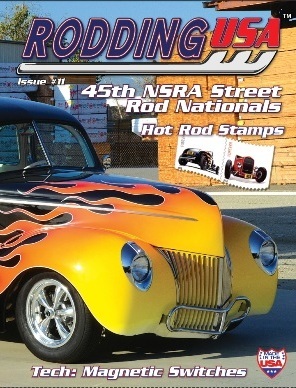 Rodding USA magazine's Issue #11 is Sold Out. Issue#11 features six of the best traditionally-styled hot rods including masterpice features on Donnie Hamilton's Model A coupe and Chuck DeHeras' '40 coupe.Our special features include a look at Hot Rod Stamps and a report on the amazing architecture coming up for the revamped Petersen Museum. We tour SoCal Arizona's facility as they mark celebrations of their 40th anniversary. Event coverage includes Billetproof in WA plus extended coverage of NSRA's 45th Street Rod Nationals in KY. We take a look at Designer Castle nuts plus LED tail lights and magnetic switches. All this plus our regular columns and features and don’t forget our growing list of dealers. Rodding USA, by hot rodders, for hot rodders.